[San Francisco Bay Area Sketchers in Oakland, San Jose, San Francisco, Sebastopol and Walnut Creek] People from all walks of life joined the Women’s March on January 20 and January 21, 2018. Events were held in at least 250 locations around the country. Close to 200,000 people marched in the San Francisco Bay Area. Here are sketches from across the Bay Area documenting that march. 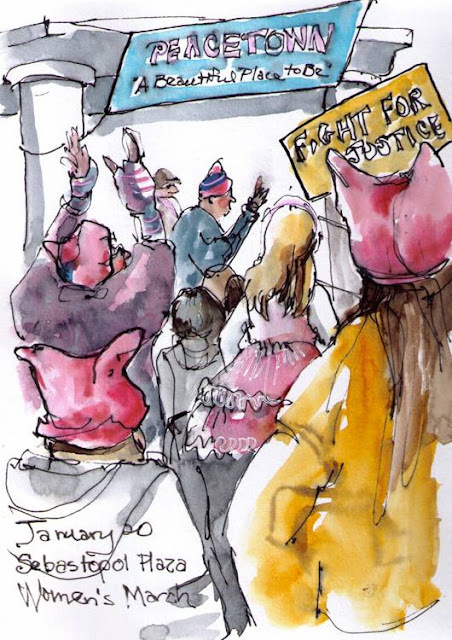 From Susan Cornelis: Sebastopol, aka Peacetown, filled the plaza yesterday with pink hats, protest signs, music and speeches, and a crowd of all ages in undisputed support for women’s and all human rights! From Cathy McAuliffe: Why go to only one Women's March? Oakland and San Francisco both had marches and I went to both of them. Each had big crowds and great signs! 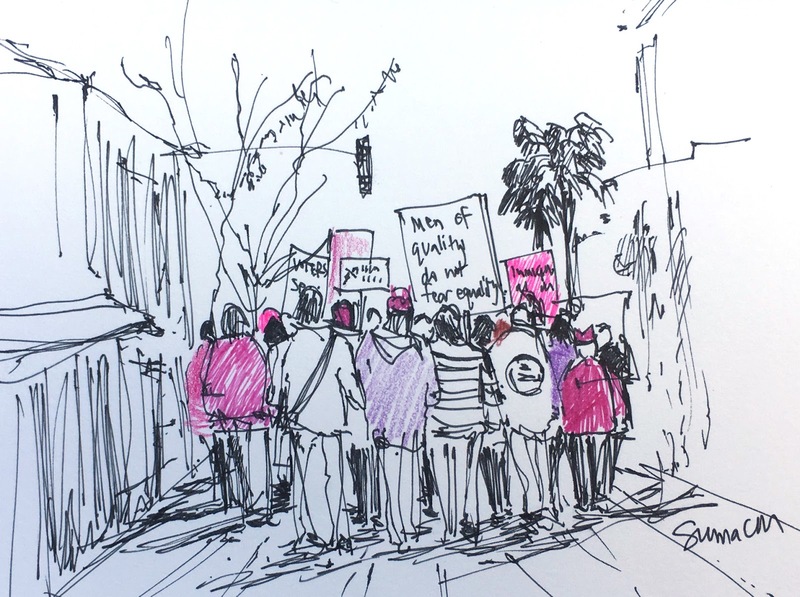 From Suma CM: Brought all the pink & purple pens and pencils to sketch the march today in San Jose! 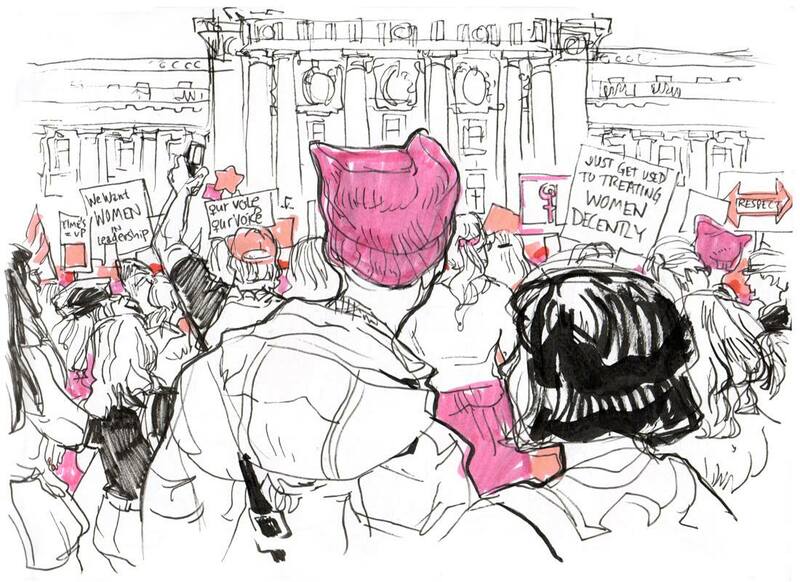 From Jenny Kessinger: Last year, I attended the Women’s March in Walnut Creek the day after the inauguration in the rain and was surprised by the size and enthusiasm of the crowd. 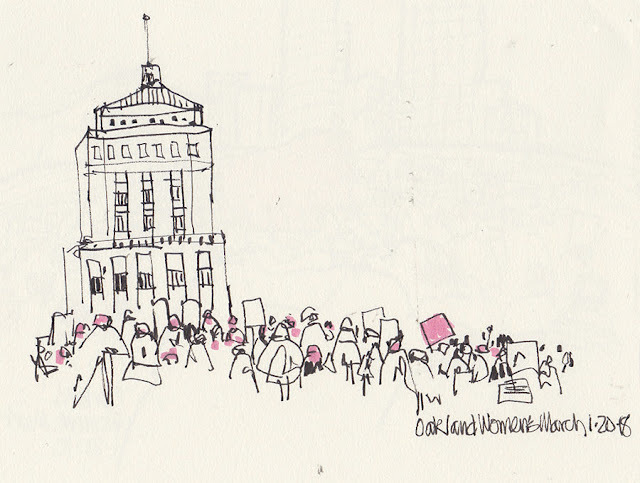 This year, I wanted to document the March in my sketchbook and was happy to see a crowd that was just as big as last year’s. From Mark Simmons: (sketch above and at the top of the page) Sketches from the initial rally at Civic Center in San Francisco. Sadly I was too far in the back to see the actual speakers. From Steve Krapek: At the San Jose Women’s March on Saturday. More signs and less pink hats than last year from what I could see. Not enough knitters in the Bay Area? Maybe we need an app to revive this art form here in tech land. 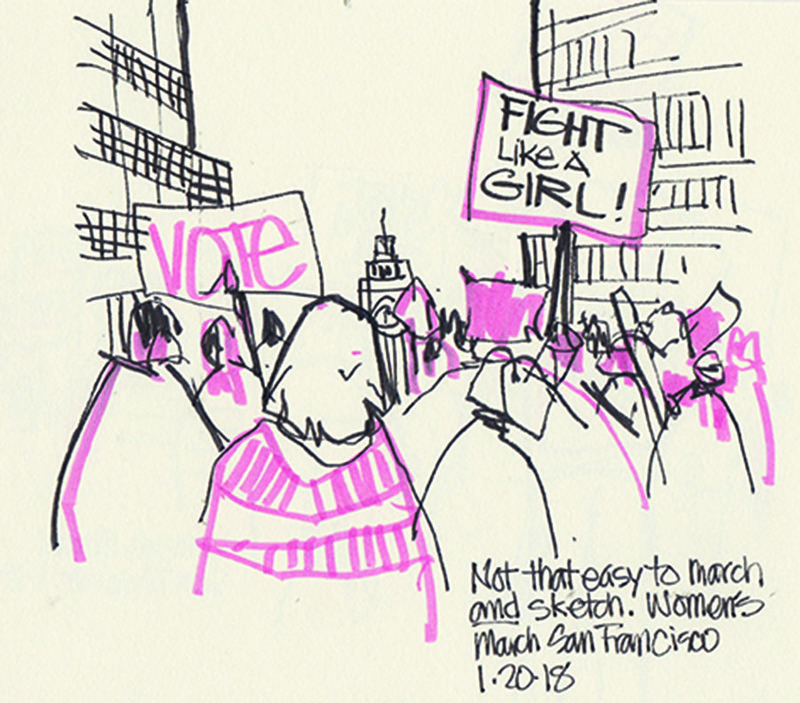 Laurie Wigham in San Francisco recorded signs and people during the march. 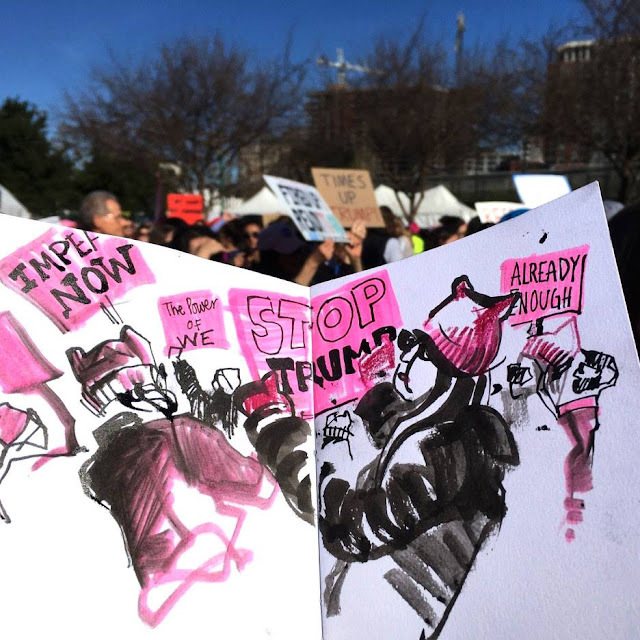 Suhita Shirodkar marched again in San Jose in a sea of pink. Susan Cornelis marched in Sebastopol. Cathy McAuliffe (aka Gus McDuffie) marched in Oakland and in San Francisco. Suma CM, Steve Krapek, and Suhita Shirodkar marched in San Jose. Jenny Kessinger marched in Walnut Creek. Mark Simmons and Laurie Wigham marched in San Francisco.